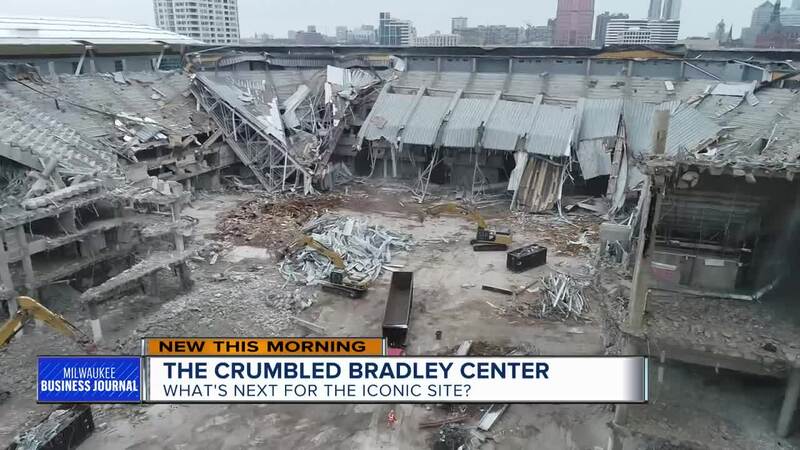 MILWAUKEE -- Less than 100 feet from Wednesday night's playoffs at Fiserv Forum, is an eyesore that tugs at fans heart strings: the now crumbled Bradley Center. A controlled explosion took down the roof January 13. A spokeswoman for the subcontracting company working on the site tells TODAY'S TMJ4 by June what is left will be all gone. We spoke with our partners at the Milwaukee Business Journal about the reason why what's to replace it may not happen anytime soon. Milwaukee Business Journal's senior reporter Rich Kirchen knows Bucks leaders want a hotel. "The question is what kind of hotel? They would probably like it to be a four star hotel," said Kirchen. "They've also talked about a boutique hotel which would be a smaller hotel." Kirchen warns construction that what comes next may be delayed because of the Democratic National Convention in 2020. "Specifically the Bradley Center site, they're gonna have to probably hold off until for another 15 or 16 months." Kirchen cites security concerns during the DNC and space for all the media expected to come to Milwaukee from around the globe. "It would be a media village," he said. "They would set up all these semi permanent structures or tents, so that's probably the short-range perspective." All of this is expected to bring hundreds of millions of dollars and endless opportunities to our city. The only thing that needs to happen first is a Game 2 Bucks win. Alex Lasry with the Bucks, who is also chair of the Milwaukee DNC, has told TODAY'S TMJ4 they are already planning to pave concrete over the Bradley Center site, and leave the space open for the July 2020 convention.